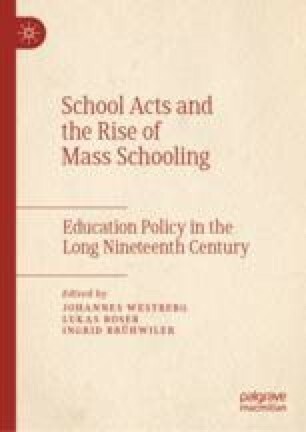 This chapter focuses on arguments in the parliamentary discussions about the Dutch school acts on primary education in the long nineteenth century. The Dutch case is of particular interest, not the least since it sheds light on the challenges of educational policy in a state divided by religious convictions between Protestantism and Roman Catholicism and between orthodox and enlightened Protestantism. We address the questions of how and why a number of school acts were issued from 1801 until 1920 and how their content and intentions changed over time. We will also address the question of why, notwithstanding their fundamental differences of opinion, all parties regarded mass schooling as necessary for nation-building. For all parties were “believers in the nation” even though they had different beliefs and interests in the nation and education for citizenship.